Morgellons disease is a poorly understood skin condition associated with Lyme disease. Patients suffering from the disease often have spontaneously-appearing, slowly-healing skin ulcers and may have crawling or stinging sensations in their skin. They may have one or more typical Lyme disease symptoms such as joint pains, muscle aches, “brain fog” and fatigue. People with this affliction produce microscopic filaments or fibers that project from skin lesions or can be seen under the skin using a handheld microscope. The fibers are often oddly-colored, mostly black, white, red or blue. 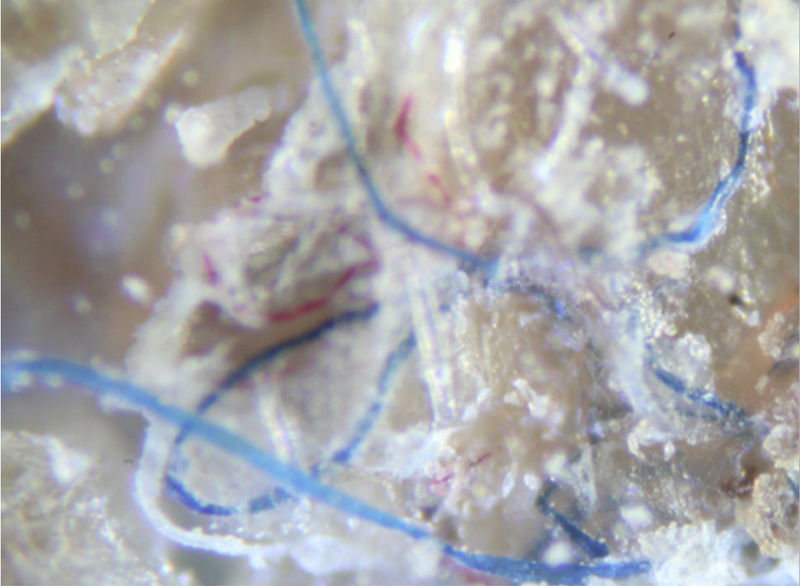 Most doctors thought the skin ulcers in Morgellons disease were caused by self-mutilation and that the filaments were textile fibers implanted by patients. Our research has shown that the bizarre filaments seen in skin are not textile fibers, worms, insects or living organisms. Instead, they are composed of collagen and keratin, normal components of skin, hair and nails that are growing in an unusual manner. The blue color seen in the fibers is a pigment called melanin. Melanin is responsible for color in normal human skin and hair. Lyme disease is a bacterial infection transmitted by ticks. The bacterium that causes Lyme disease, Borrelia burgdorferi, is a spiral-shaped organism called a spirochete that can infect different body tissues and fluids causing multisystem illness. Spirochetes are elusive, and detection in patient samples is a daunting task. Previous studies to determine the cause of Morgellons disease concluded it was a delusional disorder, but these studies were flawed because the search for spirochetes and the investigations of fiber composition were too limited. Our recent study published in BMC Dermatology in 2015 shows that Morgellons disease is associated with infection by Borrelia spirochetes. We embarked on an investigation, similar in many ways to the forensic investigations featured on TV shows like CSI, looking for evidence of the causative agent of Morgellons disease, in other words “a Morgellons perpetrator”. We knew that people with the skin disease frequently have been diagnosed with Lyme disease, so we had a likely suspect. We used multiple detection methods to accumulate evidence to identify our evasive “perpetrator”. We collected specimens from 25 subjects with Morgellons disease from across North America. These included dried specimens from skin lesions and fresh body fluids or tissues that were placed in a special culture medium to grow spirochetes in the lab. First, we visually looked for bacteria that showed the distinctive spiral shape using several types of microscopy. Fig. 2. 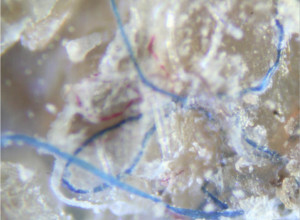 Multicolored fibers in Morgellons disease skin lesion, 400X magnification. We then looked for specific proteins that are produced by spirochetes using immunostaining – a method using a protein produced by the immune system (an antibody) to detect a foreign protein in a sample (an antigen). Antibodies and antigens fit together in a “lock and key” manner, making detection specific. Lastly, using sophisticated molecular techniques, we looked for DNA – the molecule providing genetic codes for most living organisms – and searched for sections of code found in Borrelia, but not other organisms. DNA sequencing – the process of determining the exact genetic code – can detect Borrelia DNA, providing the highest level of evidence for spirochete infection. We found our “perpetrator”. We found evidence of Borrelia infection in 25/25 subjects and DNA evidence in 24/25. Furthermore, we grew living Borrelia spirochetes from skin, blood and vaginal secretions taken from some subjects. We concluded that Morgellons disease is not an illness caused by delusional beliefs but is in reality a skin manifestation of Lyme disease caused by Borrelia spirochetes. Finding the perpetrator will help thousands of suffering people who will benefit from treatment of the underlying infection. This is the essence of science the kind of rigor you would expect from everyone else if they were not covering it up intentionally. When looking at the nucleic material of lyme vs. syphilis there is only a 46% homology; however the plasmids of lyme contain 90% code that does not match any other life form. It would seem that the plasmids would be a good place to start to look for the synthetic pathways of the Morgellons fibers. It is absolutely horrifying that people, myself included are being summarily dismissed when it is clear that Morgellons is not a delusional disorder. Like most people I have seen at least 10 doctors who either say they don’t see anything or prescribe weak antibiotics which are of no help. One woman at a CDC center here stated that I’d have to put away my microscope! Firstly, I don’t have a microscope and the Morgellons I have are clear (well blue) to the naked eye. If there is a component of mental illness, then surely it shows up after being on this horrible road of doubters, denials, and cover-ups. The other concern is that if MD is a psychiatric issue, why don’t we hear of suffers getting well with the help of psychotropic drugs? I have yet to see a study that reports even one case where the psychiatrist saved the skin of an MD sufferer.